Discussion in 'Canon InkJet Printers' started by LoRenx, Nov 2, 2018. I bought a Canon MG5750 inkjet photo printer a little while ago and the overall print quality is great. Photos on a premium glossy paper look gorgeous. But there occurs this very odd color shift when I split the image up into two (in GIMP) and print each on a seperate paper. Right on the merging point of the two, one image is really light while the other looks normal (or maybe the other is also off). So, what could cause this? Welcome to the forum, LoRenx. What is your process for splitting the image in GIMP? Have you tried a different software other than GIMP to split and save your images and then print them? could you please print a nozzle check immediately after the first page and post it here ? I choose Transform Tools > Crop and then choose one half of image and export as .jpg with Quality at 100, Optimize unchecked and rest at default. To me it looks like that source images are OK and the printing (mechanical/physical aspect of it) works fine. I wonder if there could be some sort of software issue in printer, like could there be something wrong with firmware or something which makes it interpret .jpg as it pleases (I know, it sound dumb). I may have missed the boat on this one, but can I ask a simple question: - Are they two separate photos.. If this were due to poor ink flow then it would be the most amazing case I've ever seen. The tonal contrast in the affected 2nd image would have to be the sharpest transition ever caused by variable insufficiency of ink, including no apparent streaking or banding. Were these images printed in portrait or landscape mode? Have you noticed any other issues when printing anything else? If the images were printed in portrait mode then ink insufficiency can be ruled out. The dark Cyans of the water are similar in one half of the affected printed image as in the unaffected first image printed. I doubt the ink cartridges can recover that quickly on each pass and do so in such a constant fashion for the entire print. I would expect some variation of ink deposition as the print head passes across the paper during printing. But, if these images were printed in landscape mode then it may be that the second image starts off printing the same dark Cyans of the water as the first printed image and then fades near the halfway point of the print. It sure is a sharp transition that remains constant, which makes me think it is not a variable decrease in ink flow as I would expect due to poor ink flow through the sponges of the cartridge. Maybe a nozzle check right before printing of the images and then another nozzle check immediately after printing of both images for comparison would be better. Again, this may only be helpful if the images presented in OP's post were printed in landscape mode and the change in color saturation occurs at the near halfway point in the printing process. I think it worthwhile to try a different application to split the original application and then print it out. If you post the original image then maybe someone will try to recreate your issue. What happens when you change the print sequence - which image gets the color cast ? always the 2nd one regardless ? What happens if you do the first print, give the printer a brake and print the 2nd part some time later ? and the change in color saturation occurs at the near halfway point in the printing process. I somehow remember such a case from longer time - years ago, I think in the German Druckerchannel forum with a light color/small droplet size patch dropping out. Great alternative approaches. There's usually more than one way to skin a cat and you've found it. Yes, they are two separate .jpg files. However, they are cropped from the same single .jpg and exported with identical max quality settings and they look color wise perfectly consistent. I have tried different approaches, and so far unsuccessfully. Leftmost image was taken a month ago while the others were taken yesterday and today. 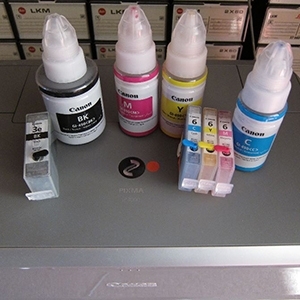 During printing, the older one had partly different set of ink cartridges. Centermost was taken lower half first while the others where printed upper half first. So in case of centermost, the first printed picture got color cast. Rightmost had its image files in portrait orientation while the others had their in landscape orientation. However, it is important to note that the issue occurs when image is split in over-and-under manner and not when it's split in side-by-side manner. To me, it makes absolutely no sense. For example, these two have no perceivable color shift (as they are split side-by-side). In fact, it can be so good in side-by-side printing that when perfectly alligned, the centerline can disappear. You have to get really close to see the split. It took me like 5 pairs of pictures to get them perfectly alligned (this paticular printer needs exactly 1.2% of overlap which I calculated keeping in mind A4 aspect ratio and manually set in GIMP), but at the time I thought that this was the only major issue that I was going to face with printing split images. Boy was I wrong. And here is another example of color shift. While the shift on this one looks quite a bit milder, it is still very much present. So to reiterate, I really think the printing process (from mechanical standpoint) is fine. A little off-topic, but yeah, I now get that I should have bought A3+ printer for larger prints. I only ended up tring photo printing by chance. My laser printer's scanner broke and oddly enough, standalone scanners cost as much as printers with scanner, so I went with this one. Then I realized that cartridges are going to dry up in less than half a year, so I might as well try some photo printing while I still can. I only put the cartridges in in the first place, because the friggen thing won't scan a thing without them in. So one thing led to another and now I ended up with this problem. If side-by-side split printed images show no color shift but top-bottom split printed images do, then this is yet another indication of application (or setting) error, not a printer-ink error. Again, try a different application than GIMP to split and print your image. Also, why the "spoilers"? If you do not want a large image overtaking the post then use the "thumbnail" button after you upload the image.